I was reading and thinking through the Ten Commandments in my quiet time this week and began to walk through some interesting insights. Perhaps for many this is old hat, but it was new to me and certainly caused me to pause and think. In Exodus 19 we see the fulfillment of what God had told Moses at the burning bush, that he would bring the people out and that they “would worship Him at this mountain.” Sure enough, there they are in the place where God said. Moses first consecrates the people, and he tells them to cleanse themselves and prepare to meet with God. [For those that like alliteration: Consecration, Cleansing, Communion.] The important point is that there was definite preparation to meet with God. God was about to give the “ten words” and they had to be ready to listen, able to hear Him. The first words were words that revealed who He was: “I am the Lord your God.” The first four commandments deal with how to maintain a right relationship with God: No other gods, do not make any idols, do not take the name of the Lord in vain and remember the day set aside for worship. Maybe another way at looking at the first one would be to mediate on the uniqueness of God, – there just isn’t anyone or thing like Him, He is holy, “set apart,” Creator, not just creation. Taking the name of the Lord in vain might be understood as relegating His name and character as something less than holy and special. Learning to set our lives apart for God is the essence of the last of the first four. God has called us to be a holy nation, a people set apart for Himself. To fulfill what God has called us to do, we must learn to have that time where we are set apart for Him each week. Keeping the Sabbath holy, or set apart, is a discipline and a focus more than it is a set of laws of what one can and cannot do on Sunday. The last six deal with maintaining right relationship with others: honoring parents, not murdering, committing adultery, not stealing, not lying, and not coveting. These have been covered so well by so many, I will not attempt repeating the obvious. So, let’s move on. Notice that there is first a recognition of who God is: “our Father in heaven, holy.” He is unique, He is the only one. Not only that, but we are not to allow anything to get in the way: “your kingdom come, your will be done on earth as it is in heaven,” that is, in heaven there is no confusing anything else as something worthy of worship. Our prayer centers itself around the recognition of who God is and desiring all that is in heaven be realized here. The first part of the Model Prayer deals with our relationship with God. The last part deals with our relationship with our needs and our relationship with others: sustenance, food, those things we really do need to stay alive and our need to relate to one another in forgiveness. Since God has been full of grace and mercy to us, we need to be as He is to others. We also need to realize our own weaknesses in a fallen culture to conform to standards that do not reflect God’s kingdom and will,– to fall to temptation. For this we ask for God’s help from Satan’s deceits. First, God is the initiator: He calls them to the mountain and He calls the disciples to Himself. Secondly, God reveals Himself, His nature and character: He is the self-existing one, the I AM, He is Holy. 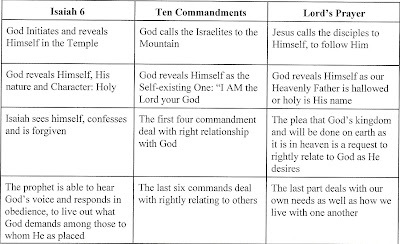 Next is how we properly relate to who God is: from the first four commandments and the first half of the prayer. You might ask how that relates to the Isaiah passage, and that’s a perfectly good question. When the prophet saw the greatness and holiness of God, he confessed his sin and was forgiven; that is, there was a restoration of relationship with God, as well as a the understanding of who we are related to who He is. If we are to be rightly related to God, we must recognize who He is and who we are and be in right relationship through confession and forgiveness. The last part of the Isaiah passage, – being able to hear God’s voice because of the right relationship and responding to His will and ways, – deals with how we are to live out in our time and culture in relation to others who He is and desires. The last six commandments and the last part of the prayer help us have some handles of how to live our lives in a fallen culture, while still praying that things here would be as they are in heaven. • So what difference does all this make ? However interesting all this might be, the question must be asked, “So what?” Well, I have no idea what all this might mean, but I believe here’s at least a drop of water in an ocean of possibilities: God, from the very beginning of creation has desired a relationship with His creation. That relationship was not because God had a need, for as God, He has no needs. The relationship exists so that through His fellowship and the understanding of knowing who He is, we reflect praise and glory back to Him. Far from an egotistical tyrant that creates just to prove himself as powerful, we have a loving Father who takes the initiative to reveal Himself to His creation so that by knowing Him and seeing His glory they might see His greatness and be blessed and return that blessing in praise and adoration. Worship, then, is that natural response to God’s revelation of Himself and how we are to relate to Him and one another because of that revelation. God has desired this from Eden, through the Exodus, through the prophets of the Old Covenant, through the Sermon on the Mount, through Gethsemane, the empty tomb and the Great White Throne. Worship is recognition of who God is and relationship with Him that will complete itself in obedience. Our desire is that our worship here be as the worship is “in heaven” and that we relate to God as holy, for only He is worthy; that we relate to others by the transforming power of Christ in our lives so that Christ’s nature and character are seen through us and that we become the disciples that reach others so that they might share in the relationship, and come to share with others as well. My husband just gave me the same revelation a few days ago. My heart jumped as I heard him initiate and articulate the intention of the Lord's prayer in Matthew. My husband had expressed his disappointment with pastors that have not preached the Lord's prayer interpretation correctly. The disciple asked the Lord, Teach us to pray. The Lord's prayer shows us how to see Him. I believe the Lord will return soon. I've been a Christian for 34 years and am so glad that you were able to post your reflection just this year. I'm thankful for the internet and that we can know there are other Christians whom the Holy Spirit also reveals the same message (of the Lord's prayer). I thank the God above, the only God, for saving my soul. I pray He comes soon for us. Pray for pastors to quickly have the clarity and soberity to help more Christians. My husband has been involved in church administration and has been studying, full-time, the Bible for 3-4 years. 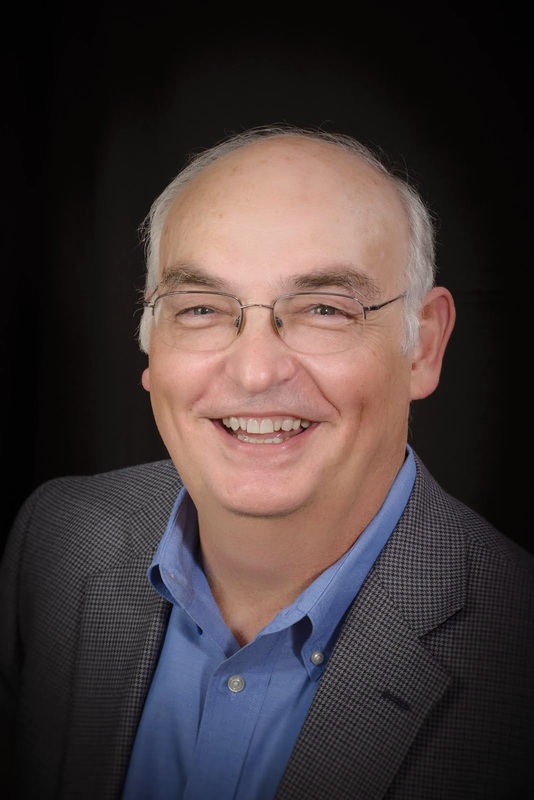 We've observed the "development" of congregations and their leaders. Churches desperately need prayer, not for more money but for spiritual guidance. I'd like you to consider Revelation 6 and the opening of the 6 seals. Have you ever read the chapter as an analogy of church history? Please let me know what the Holy Spirit says to you. Revelation 2 starts with church history throughout the 7 time periods from the time of Christs death until the end, it is a literal condition of the church at the time also a period through the church age( remember the bible must apply to every generation) also it is type! Revelation 6 shows you the same picture from a different angle , it focuses on the gospel herald and its condition throughout the time period! We are between the sixth and seventh seal now!! Historical continuous view is the only one that makes sense! God bless! Thanks for your post and to hear of your depth and interest in God's Word. Something that has really helped me as I study Scripture is try to understand first what God was saying through the author to those for whom the writing was originally written. With the Revelation of John this is a great challenge, since there are so many views already, but I still find it helpful to back up and understand. Once there is some clarity as to the original intention, then possible applications might be made, as long as we realize that Scripture will not contradict itself, so any "insights" we might have that are not consistent with the whole of what Scripture teaches must not be given ground. Not restricting such interpretations have given birth to cults that call themselves biblical, but really are not. Great commentary...but the Sabbath is not, and never has been, on Sunday. Keeping the Sabbath holy, or set apart, is a discipline and a focus more than it is a set of laws of what one can and cannot do on Sunday. Your intention to encourage setting aside specific time of worship is a good one. But Jesus said not a jot or a tittle should be changed in the Law--and it is to be written on our hearts. It is written, " The Sabbath is the 7th Day" I understand good Christians have 'jotted" and "tittled" the 4th commandment, but your points --when honoring the Sabbath established by God and not "fig-leafed" by man--are beautiful! Thanks! Thanks for your comments. It is true that the Sabbath is the 7th day, yet we do need to remember that the apostles from the very beginning celebrated the resurrection of the Christ on the first day of the week. Christ was the fulfillment of the old covenant, so we center our worship around the life of Christ. At the same time it is wise to take a Sabbath rest, not in an attempt to achieve righteousness; that is done through the work of Christ on the cross, but take time to mediate on His goodness and grace. I would recommend Peter Scazzero's book the "Emotionally Healthy Church if you are interested. Again, thanks for your comments, may God continue to bless you and your ministry.